In recent weeks, there has been a lot of talk about employment and unemployment in Zambia. Leaders at various levels of Government have called for investors, especially investors from outside the country, to do more to create jobs for Zambians. The labour movement and a number of civil society organisations have also joined the chorus and voiced their concern at the levels of unemployment and called on government to take practical measures that will ensure Zambians are given priority when companies hire people. In reality, what is being advocated is a more effective implementation of a long standing national policy commonly referred to as Zambianization. I don’t know what the position is now, but a few years ago a committee to oversee the implementation of this policy was active and hit the headlines on a number of occasions. If the committee still exists, one does not get to hear much about its work. This paper contends that another avenue for the creation of an even greater number of jobs for Zambians exists which the country is currently not exploiting. It is a well known fact that out of a potential labour force of between five to six million in Zambia, less than 10% are in formal employment., The remaining 80% plus of this mass of able bodied men and women curve out a living engaged in the so called informal sector as owners of or workers in small businesses. Although this sector is responsible for the livelihood of the majority of Zambians, in my opinion, not enough is being done to address the challenges that the sector experiences, with the inevitable result that the sector continues to provide insecure and inferior jobs which bear little effect on addressing the scourge of poverty. It has been argued that the best panacea for addressing the scourge of poverty and improving the living standards of citizens is the creation and provision of decent jobs. Unless this is done there can be very little hope of getting out of the poverty trap that Zambia has found itself in. That is why governments the world over pay so much attention to job creation. The Obama administration in the USA lost its majority position in congress to the Republicans in the mid- term elections held in November 2010, mainly because of the persistent high unemployment level in the USA economy of about 9%. What options are there for Zambia to create the numbers of decent jobs necessary to begin to absorb the millions of the unemployed in the economy on a sustainable basis? In advanced countries like the USA, EU and the UK, small businesses are major contributors to gross domestic product (GDP) and employment creation. In the US for example, it is reported that small businesses generate up to 50% GDP and over 50% of exports come from firms employing less than 20 people. In the UK small firms generate 62% of employment and in the EU it stands at 60%. Unlike in Zambia, the jobs being created by most small businesses in advanced countries are decent jobs, meaning they offer security and good conditions of service. This is because government policies and support programmes in these countries have made it possible for small businesses to grow to levels where they are able to create and offer decent jobs and to some extent, because of this support individuals with an entrepreneurial gene in their makeup are encouraged to venture out on their own. Over time, thousands if not millions such individuals set up small businesses which in total add up to millions of not just jobs, but decent jobs. This approach is not unique to advanced countries only. So called emerging economies such as Brazil, Russia, India and China (BRIC) are following their own brand of support to entrepreneurship in their countries. Who is an entrepreneur one may ask and how can entrepreneurship be fostered? The Oxford English Dictionary defines an entrepreneur as a person who attempts to profit by risk and initiative. The definition emphasize the exercise of a high degree of initiative and a willingness to take high risks as attributes that sets apart an entrepreneur from the ordinary person in any society. Central to all this is change. Most ordinary people find change threatening. To entrepreneurs, change creates opportunities that they can exploit. Sometimes, they initiate the change themselves. Other times they exploit change created by the external environment. This exploitation of change to create value is what is often referred to as innovation and is an essential tool for every entrepreneur. He or She identifies a commercial opportunity and then exploit it. An entrepreneur will see opportunities where others don’t. Today, most countries, both developed and developing, have come to recognise and embrace entrepreneurship as a necessary tool to the development of a healthy, vibrant and competitive economy. In the developing world, a good example of a country that has benefited from embracing entrepreneurship is Rwanda. This is a country whose population and institutions had been decimated by genocide in the 1990s. Today through a deliberate effort by the Rwandan Government to promote entrepreneurship, the country has made spectacular leap on the latest “Ease of Doing Business” ranking from the World Bank, from 143rd on the list to 67th and its per capital Gross Domestic Product (GDP) has almost quadrupled since 1995. This remarkable achievement has only been possible because of the commitment and consistence by the Government working with the private sector and other stake holders in a coordinated way to execute agreed programmes to promote an entrepreneurship ecosystem in Rwanda. By ecosystem is meant a set of individual elements such as policies, leadership. Culture, capital markets etc. that combine in a complex way to drive the entrepreneurship train forward. In isolation, each element is to entrepreneurship but insufficient to sustain it. Together, however, these elements turbo-charge venture creation and growth. In particular growth of small businesses in whose wake thousands of jobs are created. Studies from around the globe consistently link entrepreneurship with rapid job creation, GDP growth and long term productivity increases. In the developed world, Ireland is a good example of countries that have successfully transformed their economies through the promotion of a culture of entrepreneurship with the government taking a leading role. It worth repeating that governments must be in the forefront in building environments that nurture and sustain entrepreneurship while working with the private and other stakeholders, and using, as much as possible, home grown solutions- ones based on the realities of their own circumstances, be they natural resources, geographic location or culture. It is said that there is no exact formula for creating an entrepreneurial economy; there are only practical if imperfect road maps. Serious governments must therefore be prepared to exploit all available experiences and commit to ongoing experimentation as there is no magic wand to come to their aid. Coming back home to Zambia. The big question is, as a country and as a people, are we doing enough to promote the culture of entrepreneurship? Is there a coordinated programme one can point to as an indication that the country is taking the promotion of entrepreneurship seriously, or is it business as usual? It has to be admitted that compared to countries like Rwanda and even Botswana next door, Zambia has a long way to go in creating a favourable or conducive environment that nurture entrepreneurship among its citizenry. As a country, Zambia needs to pay greater attention to its huge informal sector where most potential entrepreneurs are languishing and unable to breakthrough and grow their small businesses. The country has to break the vicious cycle of poverty through the promotion of an entrepreneurship eco system that gives hope and provide budding entrepreneurs with the kind of comprehensive support that will lead to the creation of thousands if not millions of decent jobs. Only then can the impressive economic growth statistics we boast so much about have meaning. With the comparatively high literacy levels that the country has attained, there must be thousands if not millions of potential entrepreneurs out there waiting to blossom, given the right environment. 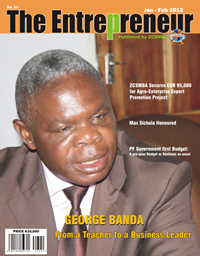 That Zambians have what it takes to become successful entrepreneurs is borne out by the fact that there are many Zambians in countries where a conducive environment for entrepreneurship development exists, who have taken advantage of this and become very successful entrepreneurs in their own right. As pointed out earlier to create the kind of environment that promotes entrepreneurship, it is not enough to provide one or two elements of the entrepreneurship ecosystem. Zambia needs to go beyond the few incentives to SMEs in the Zambia Development Agency (ZDA) act to nurture entrepreneurship. A total package of a number of elements such as financial support in form of venture capital, skill training and upgrading ,coaching, counselling and handholding; policy and regulatory reform, infrastructure in form of industrial parks, incubators etc, all properly coordinated is what is required in order to nurture and grow successful entrepreneurs. The encouraging thing is that the SME landscape in Zambia is not strange to all these elements. Most of them exist in some form or are in the process of being introduced. What seems to be lacking is coordinated approach to their implementation. As pointed out earlier, each element on its own or in groups of two or even three will achieve very little. An entrepreneurship ecosystem to be effective requires all identified elements to be implemented as one coordinated package. This necessarily requires the identification or setting up of an agency with the necessary authority and resources to provide the coordinating and monitoring roles. I would submit that under the present arrangement the department of SME at ZDA is not adequately equipped to perform this role effectively. Above all and as demonstrated in Rwanda, political will is a must to get anywhere.